Recently we posted an article about a concept car from GFG Design and we didn’t much like it. So, asked reader Adrian Tebby, what do we like? And why? Even if this article might end up being a bit of a restatement, we might get to extract some general attributes of a worthwhile design. I have taken a little while to think about recent cars so if they are here again they can be judged in a broader context and over a longer time. In a sense this article is a “best of” the concept designs we’ve been writing about for the last few years. Re-engagement with a previous (and prescient) concept leads us to speculate on Kia’s latest Frankfurt show offering. Remember this? 2015 Kia Novo. Image: motorauthority.com. Recently DTW was on the hunt for a green car. Kia have kindly offered one in a nice grey-green. But that’s not the only good part. The car is the Novo. DTW presents this design analysis so you can sound knowledgeable when the subject comes up. 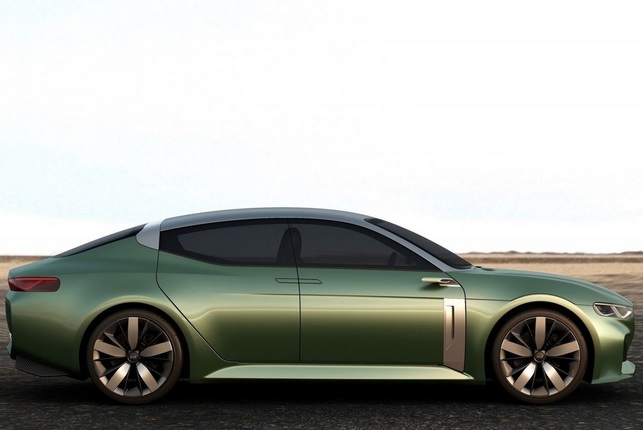 2015 Kia Novo. Image: motorauthority.com. That’s a good website. They didn’t take an Easter holiday so they reported this 6 days ago. I am rested though, and they are not. Kia chose the Seoul Auto show to present this excellent design. Either they want to upgrade the Seoul show by giving it morsels one might expect to see presented elsewhere. Or, they have underestimated the quality of this design.